You’ve created your character and breathed life into them in the pages of your story, now you need to kill them off and chosen Influenza and Pneumonia. How do keep it realistic? What are Influenza and Pneumonia exactly? What are the causes and symptoms? What would happen to your character and why, how and when would they die? Would you need to change your writing of the character? This article aims to answer these questions and make you a convincing literary killer. For more information on writing about the dying process see Killing your Character Convicngly – Staring death in the face. Influenza is a viral infection of the upper and lower respiratory tracts. 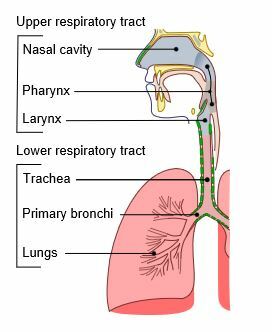 Pneumonia is a viral, bacterial or fungal infection of the lower respiratory respiratory tract affecting the windpipe (Trachea) and the lungs. Infection damages the lungs (septic shock). The Lungs swell, oxygen levels in the blood fall to dangerously low levels and carbon monoxide levels rise. Breathing becomes difficult and vital organs, starved of oxygen, fail. If infection passes into the bloodstream (sepsis), tissue in other organs can be damaged including the brain and heart and cause multi-organ failure. Viral infections are generally relatvely harmless, but can be extremely contagious and fatal. They are more llikely to be contracted by the healthy and can’t be treated with antibiotics. 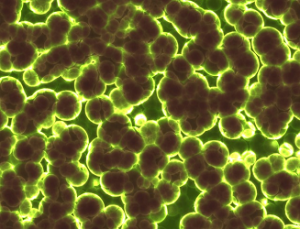 Bacterial Infectionss are the most common form of Pneumonia. They are generally contracted by the already weak and unwell and can be aggressive and hard to treat. They can, however, be treated with antibiotics. Both Viral and Bacterial Pneumonia can be spread by coughing, sneezing, touching and breathing and take 24 – 48 hours to develop. Even sufferers who do not show symptoms can be contagious. This is often the case in ‘walking pneumonia’, a milder dose of the infection that can be mistaken for a cold and be contagious for 10 days. 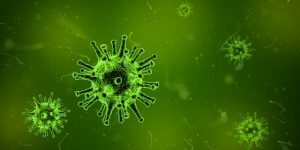 For all types of infections, the elderly (over 65), young children, those who have an existing medical condition, especially in the lungs or heart, and live or work where the bacteria lives are vulnerable to contracting Influenza and Pneumonia and the complications that often come with them. This also applies to anyone with a weak immune system. So we can name the usual suspects, alcoholics, smokers and drug addicts, along with medical conditions and treatments, Diabetes, chemotherapy, HIV/AIDS and some prescription drugs. Both Flu and Pneumonia don’t care who or what your character is, they are all fair game. To be doomed, all they need to do is have a weak immune system from the usual suspects (smokers, drinkers, drug addicts, Diabetics and HIV/AIDS) and be in the right place at the wrong time. 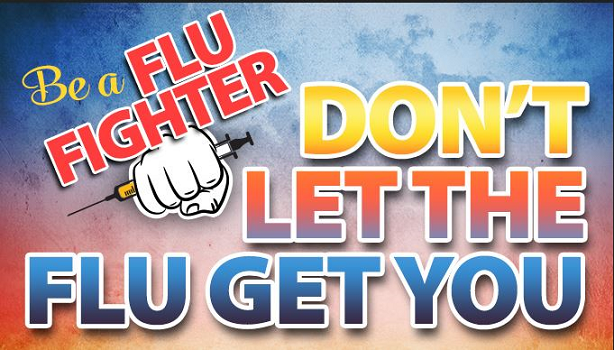 We all know the Flu, because we all get a dose every now and again. Unlike a cold, the Flu can come on suddenly and not always with a fever. Most people recover in a couple of weeks, but it can be severe and the spread of infection can cause a wide range of complications, from sinus and ear infections to the fatal. The epidemic seasonal severe flu virus (respiratory syncytial virus – HRSV) that appears in Winter in temperate climates can be life threatening and extremely contagious. The 1918 Spanish Flu pandemic killed upwards of 50 million worldwide. The infection can spread into the blood (sepsis) and into the heart (myocarditis), brain (encephalitis), muscles tissues (myositis) and cause multi-organ failure. Existing medical conditions such as asthma and chronic heart disease, can be made worse. Pneumonia is a more common complication, from the flu virus alone or alongside a bacterial infection. Chronic lung disease can trigger the flu developing into a severe pneumonia. Pneumonia bugs are transmitted by breathing in the bacteria directly or in infected fluid droplets. 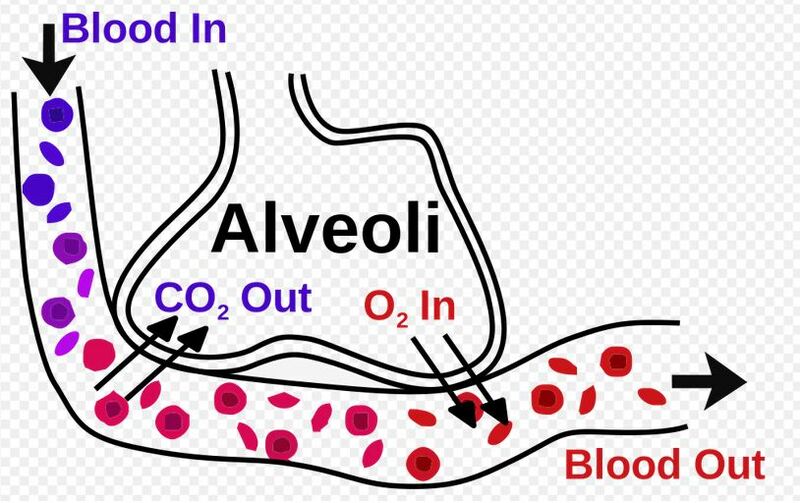 The infection causes an inflammation of the air sacs (Alveoli) in the lungs that pass oxygen into the blood and take carbon dioxide away. The infected air sacs can become filled with fluid or pus, damaging tissue and preventing the lungs from working. Lung abscess can be a complication of Pneumonia causing blood poisoning (sepsis). A cough thay may produce yellow, green or blood tinged phelgm. Headache, fever, sweating. clammy skin and chills. Stabbing chest pain that gets worse when coughing or breathing deeply. Loss of appetite, low energy and fatigue. Older people may have a normal temperature, but be confused. Viral Pneumonia is a complication of a cold, bronchitis, measles, chickenpox or flu causing the lungs to swell, blocking the flow of oxygen and affecting breathing. It generally takes 12-36 hours to develop. Aspirational Pneumonia – The bacteria forms when food, drink, saliva, liquids or vomit are inhaled into the lungs rather than being swallowed. This type is more likely to occur if you have a problem swallowing (Dysphagia) as a result of dementia, althzeimers, or stroke, or from becoming overly sedated (semi-conscious and unconscious) from the use of medications, alcohol, or some types of illicit drugs. Community and Hospital Acquired Pneumonia – Sharing facilities in a community such as colleges, military barracks, prison, or in a hospital or nursing home and sharing an infected water source. Not always serious it includes, what used to be known as Bacterial Influenza and the notorious Legionnaires disease. Legionnaires disease is a form of Pneumonia from Legionella bacteria infected air borne water droplets, where large quantities of warm water are stored and spread around large buildings such as in air conditioning and showers. In 1985 Stafford District Hospital recorded 175 cases out of which 28 were fatal. Bacteria will develop in the lungs from any kind of trauma, including introducing foreign objects. Your character may survive being stabbed in the lung, but then die from a bacterial infection around the wound. Many hospital procedures such as anaesthesia, life support, tracheostomy and catheters to drain fluid cause the lungs and airways some measure of trauma and lead to bacterial infection. It takes 48 – 72 hours after being admitted to develop pneumonia, most commonly while in an Intensive Care Unit. MRSA is a bacterial infection spread from open wounds, IV’s and any other procedure that involves inserting a tube in chronically ill patients and is a common cause of pneumonia. Initially it is spread by contact (most often on the hands) and contaminated everyday objects such as towels. It isn’t however confined to hospitals. The bacteria develops in the mould of rotting plant matter, it can be endemic in developing countries, but it can be contracted anywhere. The spores are breathed in from rotting leaves, compost, dust, trees and crops and bird, rat and bat droppings. It can also be contracted straight into the bloodstream through cuts and abrasions and by inhaling polluted water in near drowning victims. Lab workers working with the fungus are also at risk. It’s difficult to diagnose, often mistaken for other forms of Pneumonia.and can quickly become fatal. The symptoms of pneumonia often mirror those of TB, which itself can be a cause of pneumonia, so that the diagnosis can often be confused. 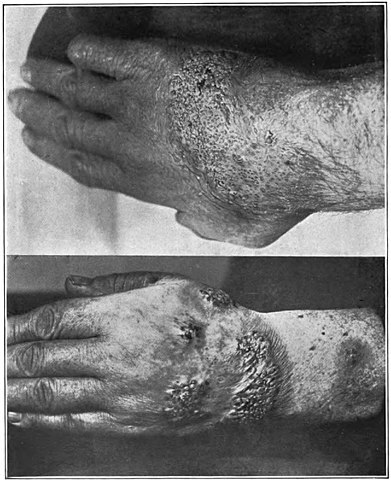 Blastomycosis, a form of fungal pneumonia can not only show the physical sumptons of lung TB, but also skin lesions (see image) and boils on the face that are not dissimilar to those presented by skin TB. To have a high risk of not surviving your character would need a weak immune system from the likes of AIDS, chemotherapy, a bone marrow or heart, lung transplant and our old friends smoking, drugs, alcohol or Diabetes. Other medical conditions that affect the lungs such as asthma, cystic fybrosis, TB, chronic bronchitis and emphysema can see them to an early grave. Particularly nasty, the infection can spread from the lungs to organs such as the heart, brain, skin, liver and eyes. It can cause blood poisoning (sepsis), invade blood vessels killing off organ tissues (see lung abscess) and cause blindness and coughing up blood. The only real treatment for vrus’s are anti viral drugs, but these only shorten the life of the infection by a couple of days. Beyond that pain killers, fluids and rest are the only treatments. 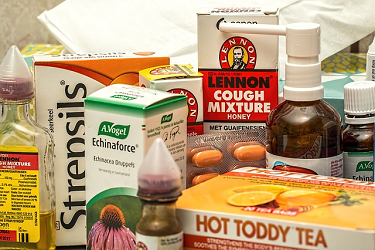 Bacterial pneumonia on the other hand can be treated by antibiotics, the pills, however, have to match the infection. The type of bacterial pneumonia is diagnosed by chest xrays, blood and sputum tests, but beyond antibiotics the treatment is fluids and rest.Complete recovery can take up to 6 months, the cough going after 6 weeks and the fever after a week. Influenza and pneumonia are the literary equivalent of a wolf in sheeps clothing and possibly one of the most promising vehicles for an apocaleptic destiny for the human race, short of reviving the Black Death. Each year the round of viral influenza becomes more of a threat; the superbugs, get more super and the vaccines more ineffective. And in the midst of all this, the western world seems quietly determined to do away with a functioning immune system.